A journey through Wales is like waking up in a detective story. And in this episode we were travelling with the genuine article. Our guide, John Wake, had been a police officer for 27 years. He spent 23 of them as a detective in the Criminal Investigation Division, and seven as head of the Drug Squad. Today, he’s an expert on the legendary King Arthur. The figure of Arthur casts a warm glow over the medieval history of the United Kingdom. He lived at a time when knights dreamt of rescuing damsels and roamed the land for the love of a quest. Arthur formed the Round Table, a meeting place of equals, where he ruled over a Golden Age the likes of which we haven’t seen since. Or did he…? What about dragons and magicians and giants? What about the Holy Grail? Oh, they were just stories, you might say. Fables tacked on. Metaphors for something else. But could you dismiss one while accepting the other? What’s the truth in all of this? Was there any truth, at all? That’s what my friend Simon Vaughan and I have come to Wales to find out. We met detective John one morning over coffee at Cardiff’s Parc Thistle Hotel, and I asked him how he developed his rather odd hobby. The intrepid guide, John Wake. An awful lot of people have written about King Arthur. Academics have fought over him, England has transplanted and claimed him, and a wide range of tourist sites bill themselves as the “real” burial place, and the place of the round table and battlefields. But no one denies that the earliest references to Arthur come from Wales. The entire topic is so full of misinformation, hidden agendas, personal interest and competing national myths that you’d have to be a detective to figure it all out. And that’s where John comes in. This was clearly a man with no patience for nonsense. “So, what do you think?” I asked, determined to appear even more hardboiled than ‘Detective Wake for The Prosecution.’ Trust me, I know how to handle these things. Wait a second: Monmouth’s fiction? We’d barely been in Cardiff a day and a half, and this man with the nose of a prize-fighter and glare that’d cut through a thousand false witnesses had already torpedoed our quest? I have to admit I was shaken. I’d grown up on stories of Arthur and his Knights, and part of me still wanted to believe. And so the three of us set out to uncover this person, this mysterious Arthur. And there were many digressions along the way. Our first stop was Llandaff Cathedral, a 12th-century church north of downtown Cardiff. John briefed us on the case as we drove. Robert of Gloucester was one of the powerful Anglo-Norman barons, the so-called Marcher Lords, placed in control of the Welsh-English border region at that time. In other words, Geoffrey wrote his book for the ruling class of his day. His book chronicles the kings of the Britons from mythical Trojan origins right up until the 7th century, when the Anglo-Saxons came on the scene. Geoffrey claimed to have based his Arthur chapters on “a very ancient book in the British tongue.” A book which has never been found, or positively identified. Monmouth’s History was one of the most popular books in the Middle Ages, particularly among British monarchs like the Tudors. It was accepted uncritically well into the 16th century, and it inspired the work of many other writers who extended the legends, in particular the Arthurian tales. Experts today regard it as a work of fiction, with a few facts sprinkled in. And yet, Arthurian scholars still treat it as the one definitive text on the real King Arthur. 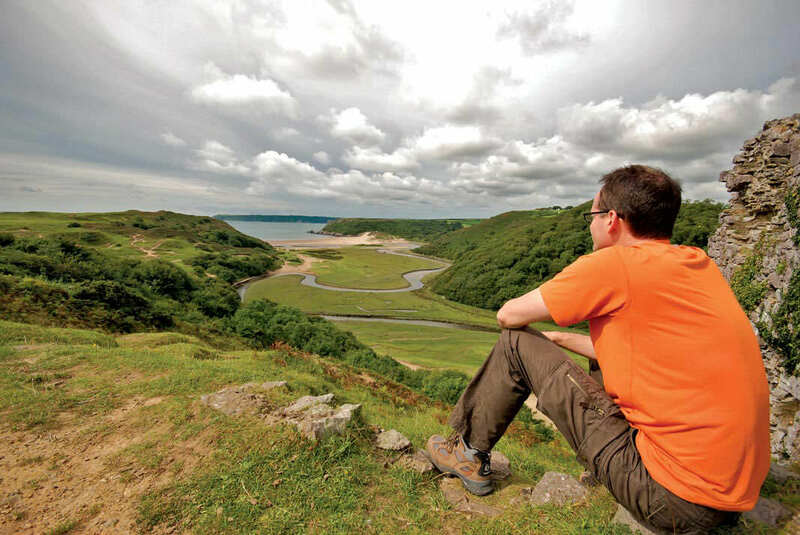 Ryan surveys Three Cliff’s Bay from Pennard Castle. By questioning Geoffrey, John was casting doubt on the one source of Arthurian legend that is accepted as a baseline by academic researchers. In the world of Camelot—Arthur’s mythical kingdom where chivalry, peace and social justice reigned—this is serious business. And with that, we arrived at Llandaff, the first stop on our journey through a confusion of fact, fiction and hidden agendas. Our detective wasn’t the type to mess around with sightseeing. We made our way straight down the vast, echoing centre aisle to a small apse tucked away near the altar. John pointed to a stained-glass window showing three figures: Tewdrig, King Arthur and Cadwaladr. A journey through Wales is like a conversation in a bar. It’s filled with digressions. You never really stick to the point you thought you were trying to make. And you never know where you’ll end up, either. It didn’t take us long to realize John Wake had a limitless ability to pull facts and odd places out of his hat like a conjurer pulling a rabbit. If there was ever a Merlin in Wales, this man is it. As we sped down the highway towards the site of our next clue, I asked him about the Roman occupation. The stone remains of a thick Roman wall stood behind a beer garden, covered in moss, with only a pile of rubbish to mark the spot. We were standing beside the ancient entry to the village of Caerwent, where the landscape still held signs of what was once a very large market town. It spread across a broad bowl of land, and I could clearly trace the sweep of the wall that marked the distant limits of the settlement. This was exactly the sort of place Arthur and his contemporaries would have known in the centuries following the decline of Roman Britain. It wouldn’t be the first such site we stumbled across in Wales. This is a place where you can’t throw a stone without hitting a 13th-century church, hilltop castle, or Roman site. Every square foot of the land has a story to tell, and in Wales, these legends are right around the corner. Our investigation continued at the nearby site of Meurig’s Well. Tewdrig was a famous 5th- to 6th-century king of the region of Gwent, an area on the Welsh border with England. He became a holy man in his later years, willingly abdicating his throne to his son, Meurig, and retiring to a hermit’s life in the Wye River Valley near the present day site of Tintern Abbey. “Tyn-Deryn refers to Seat of the King in Welsh,” John tells us. “It’s a direct reference to Tewdrig. Geoffrey would have seen the building of Tintern Abbey in his own lifetime, and he would’ve been intimately familiar with these stories.” The religious life was much to Tewdrig’s liking, but these were turbulent times. He was soon recalled to lead his old army against an invading Saxon force. “Tewdrig won the battle,” John said, “but he was mortally wounded. 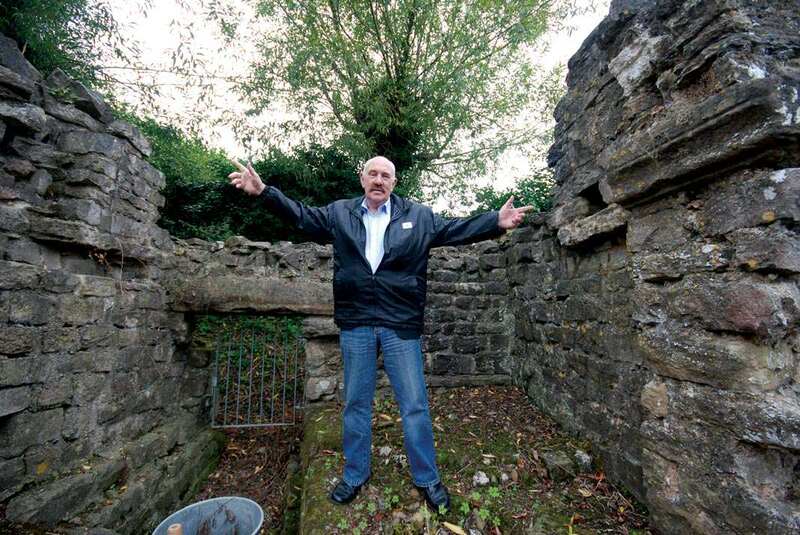 His son Meurig carried him here, to this spot, where he washed the dying king’s wounds in a spring.” John pointed to a coffin-shaped concrete box where stagnant water trickled through a pile of fading litter. The old king died nearby, and was buried beneath what is now St. Tewdric’s Church in Mathern (Tewdric being Tewdrig), our next stop on the trail of clues. This was a very old site, indeed. The churchyard wall was round rather than rectilinear, indicating that the existing 15th-century church had been built over a much earlier Celtic settlement. John led us straight to a plaque on the wall near the altar. We stepped out of the sacred dimness, back into the gentle daylight road. The whole story sounded vaguely familiar, though I’d never heard of Tewdrig before, and had no idea what our detective was leading to. “So why did Meurig bring his father here to die?” he asked—rhetorically, really. Court was in session, and I sensed he was going in for the kill. The hair stood up on the back of my arm. The parallels to Geoffrey’s legend of Arthur were unmistakable: a final epic battle where the hero, a great king, was mortally wounded; and a dying king taken by sea to the magical island of Avalon to be healed of his wounds. At that point, of course, Arthur disappears into legend, perhaps to return when needed: the “Once and Future King,” as he is so often referred to in folklore. But things like that don’t happen in real life. Bodies leave traces and stories leave trails. And so I think we might have just found our Avalon. Each element of the original Arthur story was falling into place. John fixed us with a glare that would wilt a hardened criminal. “I think this man—this local chieftain, son of Meurig and grandson of Tewdrig—was Geoffrey’s King Arthur.” It was a lot more plausible than versions locating Arthur in England. Later most writers based their stories on Geoffrey of Monmouth’s book. And one writer getting his information from another is not evidence. Geoffrey’s version is, indeed, the key to the mystery. But it’s a key that works on an oblique angle. The rulers of the time needed a plausible myth of ancestry to increase their legitimacy. Even better if that ancestry included descent from an original hero. John Wake believes Geoffrey created the story of Arthur from known people and places. He added spice from real locations and established Welsh legends, and he wove in the propaganda of his patrons. Exactly the way any present day novelist builds a work of fiction. You write what you know, and you draw characters from real life. It fit my own experience as a writer. And the evidence trail was based on verifiable facts. But several important questions remained unanswered. And so, on we went. Our journey through Wales was a walk through the landscape of my childhood imagination. It was like travelling through the fragments of dreams barely remembered, with a constant haze of déjà vu hovering over my shoulder. The day after tracing the story of Tewdrig, we were driving to the town of Hay-on-Wye, site of a famous literary festival, and home to more used bookstores than any place on the planet. It was a selfish detour forced by myself with threat of pen-point, and not even Arthur himself could stand in our way. Conversation naturally shifted to books, and that’s when John pulled another one of his conjuring tricks. I nearly slammed on the brakes, and I heard Simon’s jaw hit the back seat and bounce off. Wales was proving to be one bizarre surprise after another. We were both avid fans of Arthur Conan Doyle’s Sherlock Holmes, and The Hound of the Baskervilles scared the bejeezus out of me the first time I read it. It didn’t take long to locate the gate. As we pulled in the long winding drive and made our way towards the manor house, Simon spotted a man walking a little white Yorkshire terrier. “My God, it’s the hound!” he cried, and a fit of giggling nearly sent us careening into some sheep. Baskerville Hall has been transformed into a hotel, but the atmosphere could have been copied from the book. The coat of arms above the door showed a hound’s head with a spear driven through it, and blood dripping from the end. Inside, the massive double staircase and cavernous entry hall were true to Conan Doyle’s description. The author knew the Baskervilles well, and was a regular visitor to the house. He’d heard the family legend, and built what is perhaps his darkest Sherlock Holmes tale around it. But the novel was actually set on Dartmoor in Devon—in England’s west country. “If that’s the case, then why use their name?” I asked. I think the truth might have had more to do with landscape. Baskerville Hall was imposing but it didn’t lack warmth, and the rolling green beauty of the Welsh hills was the farthest thing one could imagine from murder and evil deeds. At least, it looked that way from the front. A caretaker tipped us off to a cluster of graves on a forested hill behind the Hall. One of the older stones read: “Our well loved little doggie, Died 23rd January 1838.” Could this be the grave of the dreaded hound? Even by day the forest cast a strange gloom. The hillside was alive with shadows, and the emptiness of the path tickled our backs with phantom eyes as we crouched beside the little circle of stones. At night this would feel like a very different place. The three of us vowed to return here next year to investigate the legend—and to read The Hound of the Baskervilles in the very house that inspired it. By night, of course, with the wind moaning low and a sound in the forest of footsteps coming closer. Baskerville Hall wasn’t the only place John Wake pulled a Merlin, and conjured up images from my childhood. We made another roadside stop that day, at a ruin called The White Castle, hidden down a narrow winding detour just off our Arthur route. 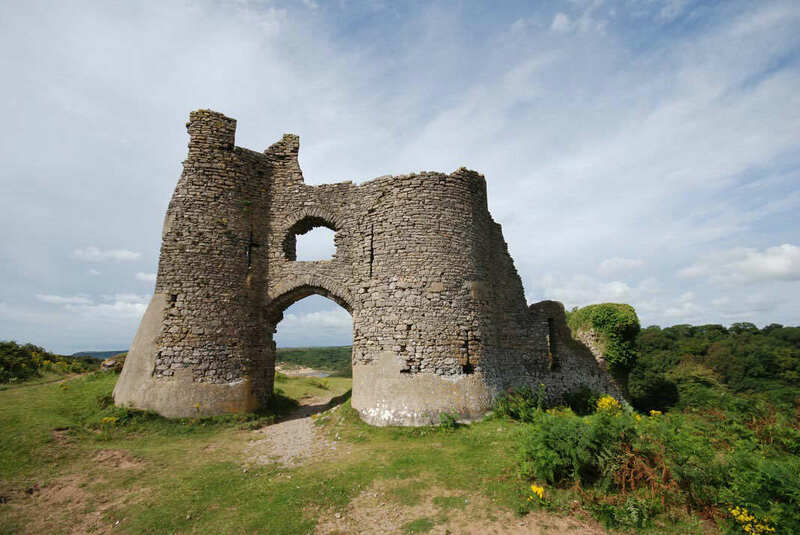 Twelfth-century Pennard Castle, a popular spot for poet Dylan Thomas. It started as so many of John’s stories did. “Would you guys like to see an out of the way castle no one ever goes to?” And we were off chasing the thread of another unexpected adventure. Set on a low hill not far from the mid-Wales village of Llantillo Crossenny, The White Castle might just be the area’s best kept secret. The outer bailey is largely intact and the main fortification—six round towers joined by a high curtain wall—is surrounded by a deep moat complete with wooden drawbridge. Judging by the state of the remains, it never suffered the demolition visited on most Welsh castles after various civil wars and revolts. Despite its military purpose, the castle was a peaceful place protected by birdsong. I climbed the stone steps of the gatehouse tower, where the sun warmed a summer-vacation scent into the air. On the grass of the outer bailey, three children were completely absorbed in an inner adventure of their own. In my day it would have been knights in armour—today, it’s Harry Potter. I was struck by how naturally they took these props for granted. They didn’t just have imagination, they had a castle to set it in. For a brief moment The White Castle transported me back to vacation days spent next to an open window reading Enid Blyton’s Famous Five stories. I dreamed of high adventure and my very own ruined castle on a private island in a lake. Of course, The Famous Five novels weren’t set in Wales. But it didn’t matter. The landscape and ancient stones conjured up the visions just the same. Simon and John climbed the tower to survey the defences and earthworks, and our conversation once again turned to King Arthur. “What about the Lady in the Lake? Excalibur, and all that?” Simon asked. For a moment I pictured Wales as a place of watery maidens who spent their time chucking swords at passing knights. The sword in the stone is an easy legend to trace, said John. In Arthurian legend, a sword (called Excalibur) had been magically embedded in a stone, and only the true-born king could retrieve it. That king, of course, was Arthur. In his book Geoffrey had once again drawn his details from the practices of the times, padding out his narrative for authenticity just as any good novelist would do. The key, once again, was stories. And it’s a key that’s particularly Welsh. Wales was magnificent in its treats. 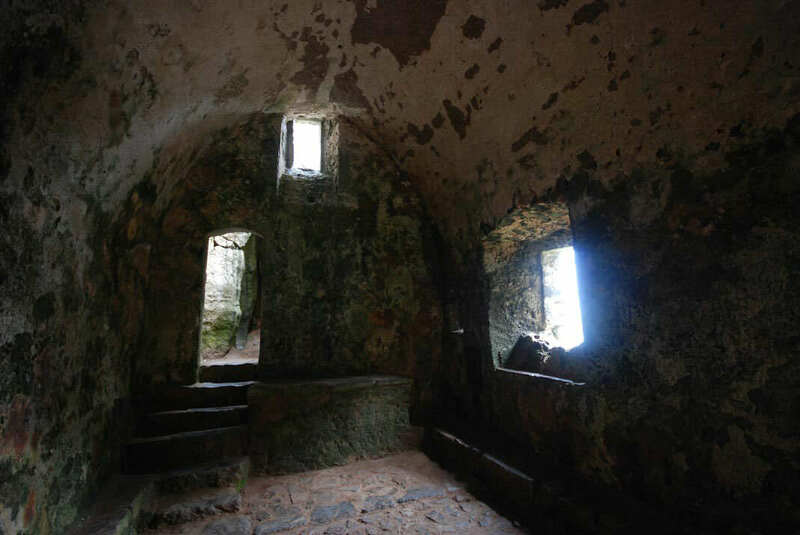 We explored the remote ruin of Carreg Cennen Castle, on its windswept limestone crag, and wandered through the perfect specimen of Kidwelly Castle, haunted by doves and the camera click of tourists. And as the pennants of forgotten armies snapped in the breeze, the soaring battlements always brought our conversation back to Arthur. If what John Wake uncovered was true—and both Simon and I believed it was—then what value does Arthur have today? Can we still accept him if the entire story is founded on a lie, a complete myth? So many writers built on Geoffrey of Monmouth’s account of what Wake calls “the world’s first superhero.” And each author added strands of their own. The Norman-French poet Maistre Wace (circa AD 1155) added the Round Table. Chretien de Troyes added chivalry and courtly romance. Robert de Boron developed the quest for the Holy Grail, bringing these tales into a Christian era. And Thomas Malory, in his Le Morte d’Arthur, pulled all the threads together into a complete narration. Victorian writers like Walter Scott and Tennyson had their say, too. They painted on a layer of their own ideals and values, using the chivalric past to educate the present. Today these legends of wizards and knights serve an age intent on escapism and fantasy. The story of Arthur transcended its place in the kingdom of Gwent, at first intentionally, when it was co-opted by the English to enhance the lineage of their kings, and later unintentionally. Each writer placed Arthur in his own time, and projected his own ideas and values onto the characters. And, I believe, it’s that essence—that story—that really holds the key. The Arthur of legend doesn’t have to be real—any more than the protagonist of your favourite novel does. For me, it’s always been a story of adventures and castles and saving the girl. I didn’t care about grails and Christianity—and especially not chastity. Instead, Arthur inspired me to see my life in larger terms. To go out and do things that frightened me. And to hold firm to my truths, no matter what fantastic monsters I encountered along the way. In the end it doesn’t matter if Arthur was a small Romano-British chieftain, or the Once and Future King. It’s the story that’s important, and what it teaches us about ourselves. We came to Wales in search of the man behind King Arthur, but we found so much more: friendship, childhood memories, mystery, and many layers of the past. On the last night of our trip we shared a pint with John Wake in a quiet Cardiff pub. We’d covered a lot of ground together, and that, in itself, seemed to be the final clue. And that, I think, is the constant here. The green rolling hills, the torn-off coast, the music of place names, ruined castles and Roman hill forts, and above all the mist which conceals and transforms. These things are constant. Everything else, pliable.